What the diagnostics business can teach us about innovation investment decisions. There are easy businesses and there are hard businesses. Then there are REALLY HARD businesses. If you ask me (and I’m living it now in my current startup, Biological Dynamics), the hardest business of all is medical diagnostics, especially for initial disease screening (is the patient healthy or sick). There are several risk factors that make medical diagnostics an inherently difficult business model, including technical, biological, market, reimbursements and regulatory. No wonder they only comprise 3-4% of all healthcare revenues – a lot easier to make money in drugs, devices and services. If it were only easy to make the actual diagnostic tests 100% accurate, things might be different from a market appeal and value perspective. Take the standard Prostate Specific Antigen test, aka the PSA test: Using the standard cutoff for healthy vs. sick of 4.0ng/ml, the PSA test is only 21% sensitive and 91% specific (It fails to identify sick patients 79% of the time and it wrongly identifies healthy patients 9% of the time) – If doctors want to play it safe, not to miss so many potentially sick patients, they can lower the cutoff level to 3.0ng/ml, which would increase sensitivity to 32% (reducing false negatives (catching more potential cases), but this would lower specificity to 85% (increasing false positives (and needless biopsies that follow). There is a correlation with PSA levels and prostate cancer, but it’s by no means 100%, because most people fall into a grey spectrum of uncertainty that spans healthy vs. indolent vs. aggressive disease, not a simple black & white, healthy vs. sick bifurcation. By its very nature of being a Yes/No answer, a diagnostic test like the PSA makes a tradeoff between being sensitive (avoiding false negatives) and being specific (avoiding false positives). This brings me to the analogy of medical diagnostics with innovation efforts within large companies. I ran a sort of internal ‘startup school’ for many years at Qualcomm – think Y-Combinator, but for employees. I am often asked what I would improve if I were to do a similar program again – meaning, how would I teach employees to be even better internal founders. My answer surprises most people – I would not waste any more energy improving the employees education until I improved the corresponding investors education (in this case, the innovation decision making ability of high-powered executives) – I would start a sister ‘investor school’, so that we could all be using the same language and match discovery efforts with proper risk taking. The internal investor school would teach only one lesson, when to say MAYBE. For some reason, when executives are put in a position to make a decision regarding a request for funding for a new idea, they think of themselves as a PSA test, being forced to make a healthy vs. sick call, a YES vs. NO decision (that professedly makes them ‘decisive’, surely a handy trait for climbing the corporate ladder in the ‘known’ business model). 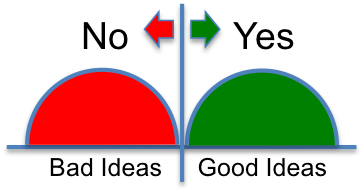 Their YES or NO approach implies that world of ideas clearly separates into two discrete halves, Good vs Bad, such as the diagram below. All one has to do is set their cutoff in the middle (normally a Net Present Value (NPV) greater than $0) and voila! No wrong decisions ever taken! This innovation stuff is really easy, at least for the executive, right? Not so fast. Just like human physiology, new ventures are rarely a red & green affair. A new idea will always be presented with some known facts, but mostly untested assumptions – a NPV calculation will rarely be accurate (hard enough figuring out the proper Internal Rate of Return, much less the 5 year revenue projections). One can also try to apply a strategic, theoretical filter (such as disruptive innovation or blue-ocean-strategy), but that may only signal a naïve starting point with regards to competition, not something that can’t be fixed through repositioning. A new idea will not appear as a clean, No vs. Yes decision, but likely include a large grey area of uncertainty, as represented in the diagram below. If an executive insists on using a simple high-pass filter, he or she will likely encounter the same tradeoff of sensitivity vs. specificity faced by the administrators of the PSA test. For example, if the executive has a habit of just saying ‘NO’, he or she risks the likelihood of False Negatives (good ideas left behind). If the executive has the equally bad habit of just saying ‘YES’, he or she risks the likelihood of False Positives (bad ideas pushed ahead). So, what could break this dilemma? Adding MAYBE to the decision mix, of course! Executives (a company, actually) can develop an algorithm that clearly defines new ideas into three categories: NO, MAYBE & YES. The algorithm will take time to develop and maintain for each specific company, but it is achievable. For example, ‘NO’ could be for a situation where the opportunity space is not strategic to the company, the right resources are lacking and there is nothing proprietary to leverage. Note: ‘NO’ should NEVER be used simply because someone thinks the market is too small – that is a measure that simply doesn’t apply to new markets (killing contrarian options as well as invaluable opportunities to learn). ‘Yes’ could be for a situation where there is clear unmet need, great resources to explore in depth, and a proprietary set of assets as advantages. If either factor is lacking or hard to determine, then the idea falls under the Maybe category and should proceed to undergo further diagnosis (neither fast tracked nor killed on the spot). The ‘Maybe’ decision or ‘further diagnosis’ recommendation is what’s called a ‘business experiment’, which I’ll cover in a future blog in more detail. This is the number one lesson that should be given to executives ‘in the way’ of innovation – break away from the Yes/No decisiveness paradigm of the last century business environment and embrace the beauty of risk management under uncertainty beseeched by the new economy. Note: The worst-case scenario is not sticking to the old paradigm of Yes or No, however flawed, which would at least imply an internal market for new ideas, complete with sellers and buyers. The worst-case scenario is having executives themselves come up with new ideas AND decide if they are good or bad – Guess what will happen? Yeap. Others’ ideas (meaning non-executive employee ideas) will automatically be categorized in the NO bucket (disguised by endless requests for more data (with no funding to get it)) and the executive ideas in the YES, just do it! bucket – If you see this in a given company, my advice is to RUN! Your company is far from implementing the Maybe option. Interesting theory and very thought provoking. It makes me wonder why more businesses don’t apply this mentality — seems as though very few things in this world can be categorized as “black or white”, yet we’ve all inevitably worked for a company that works like that. With the exception of maybe Wall Street where the buy/sell decisions must be made at the blink of an eye, most if not all corporations could probably benefit from implementing a “maybe” strategy.